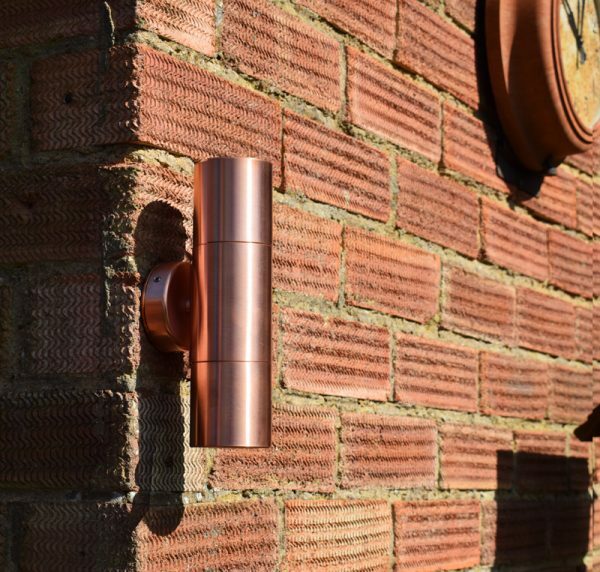 The Hilospot is a stylish twin wall light, designed for a combination of direct and decorative downlight and uplight effects using 2 x GU10s (240v). 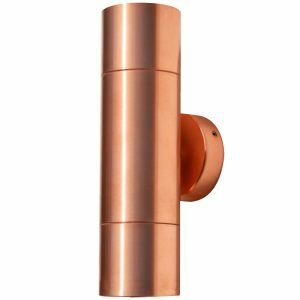 This robust double spotlight has a classic appearance, made from natural copper with polished brass detail. 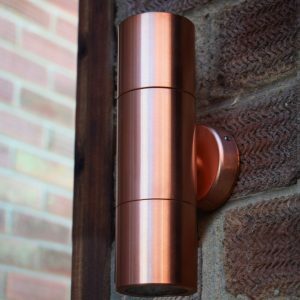 This material gives outdoor wall lights extra protection from harsher and wetter conditions and has a solid, tough exterior. Order now to receive your order on Tuesday 23rd April. 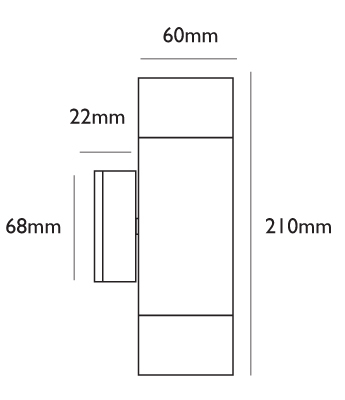 Applies to UK Mainland on items in stock and ready for dispatch. The Hilospot is a stylish twin wall light, designed for a combination of direct and decorative up and down light effects using 2 x GU10s (240v). 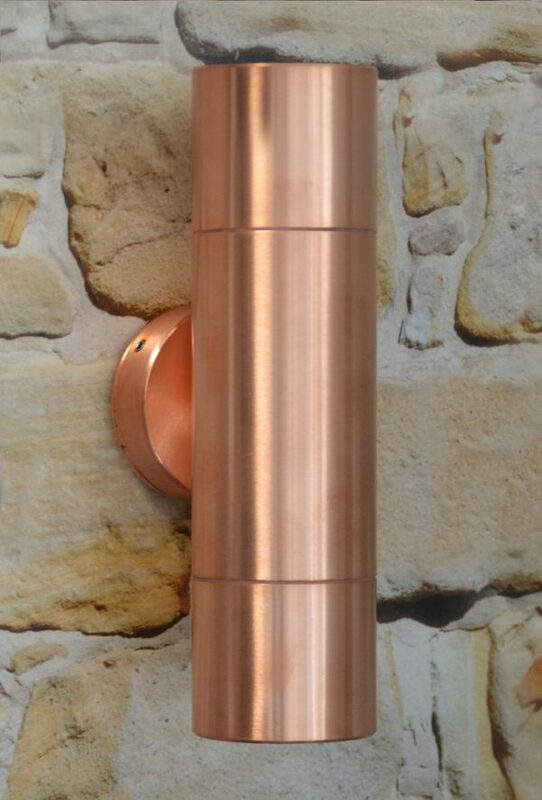 This robust double spotlight has a classic appearance, made from natural copper with polished brass detail. 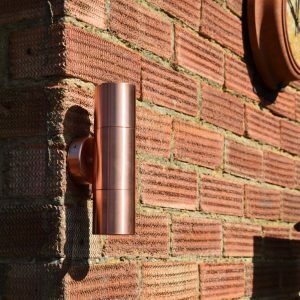 This material gives outdoor wall lights extra protection from harsher and wetter conditions and has a solid, tough exterior. Anodised Aluminium versions also available in Black and Satin Silver, along with Matt White powder coated aluminium and Marine Grade Stainless Steel (316). 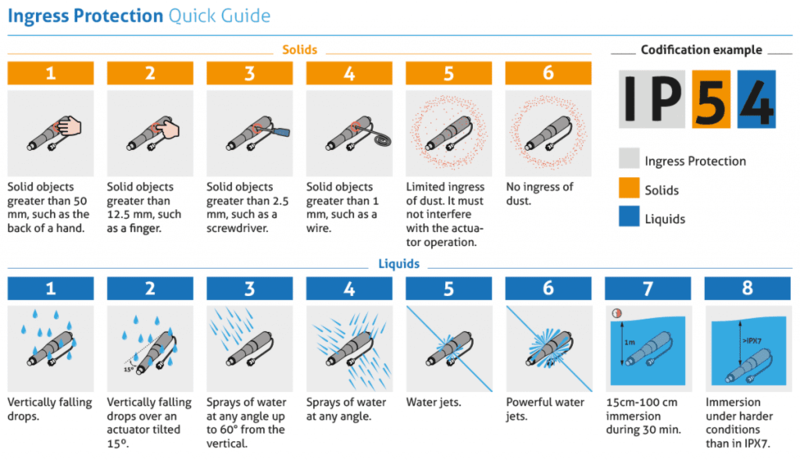 As with most purchases, it is important that items are maintained correctly after installation. 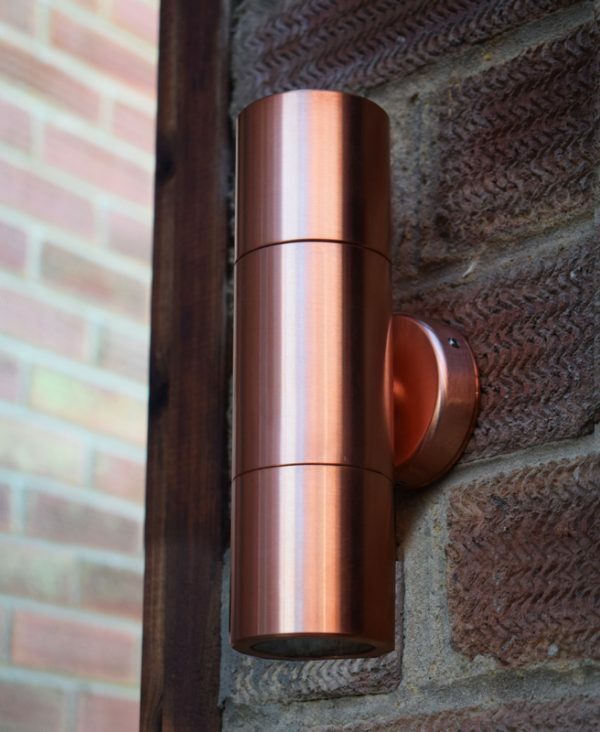 This is especially important for outdoor lighting which can be affected by the outdoor environment, especially in harsher areas such as coastal areas. By not following the aftercare instructions, which are always included with the relevant product, this may void any guarantees or warranties. 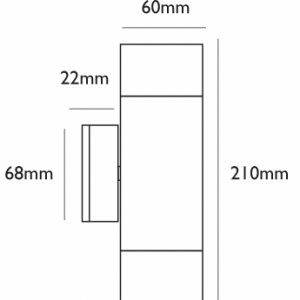 Lumena offer a number of Teak bollards and post lights in a range of sizes. Teak wood is a part of the ‘Tectona Grandis’ hardwood species and is highly durable, producing a natural oil which helps protect from outdoor conditions. As Teak is subject to outdoor weather conditions, it starts to age and develop a duller, soft, grey appearance. This elegant, lightweight wood is ideal for both domestic and commercial use and is very easy to maintain. To add a further protective coating from weather conditions, teak sealer is highly recommended. Lumena always apply at least one coat of Teak sealer prior to dispatch but this should also be applied periodically to help protect and freshen up the path lights. Contrary to popular belief, Stainless steel needs looking after; especially in exposed and coastal areas. If not cleaning on a regular basis, the acid that is ever present in the air ( and salt in coastal areas) will affect the surface causing pitting and even rust like staining (known as ‘Tea staining’ ) to appear. To keep your lights looking good, simply wipe clean the outside with a damp cloth and then dry once a month, (more frequently in coastal areas). Specialist stainless steel cleaning products can be used (We recommend and stock ‘Kilrock stainless steel cleaner’) but never use an ABRASIVE cleaner. In extreme conditions we recommend applying 2 coats of Clear lacquer to protect the steel surface. (We recommend and stock ‘Simoniz’ clear lacquer). 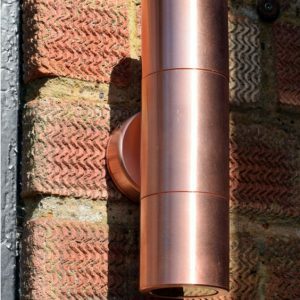 Both brass and copper are extremely durable materials, with brass being a combination of copper and zinc, meaning neither can rust or corrode. Over time brass will subtly weather and naturally change to a darker colour which will blend in with the garden surroundings. Copper also naturally changes colour quite dramatically, often resulting in a brown or ‘verdigris’ effect, again to blend in with the outdoor surroundings. This is because copper reacts with atmospheric oxygen. 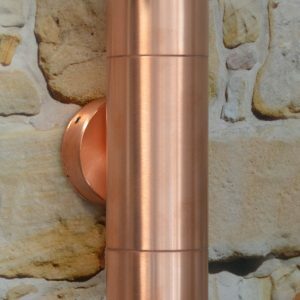 Although some people may prefer a pristine, shiny copper finish, the oxide layer in fact prevents corrosion and simply adds to the character of natural copper creating a traditional, ‘olde worlde’ appearance. 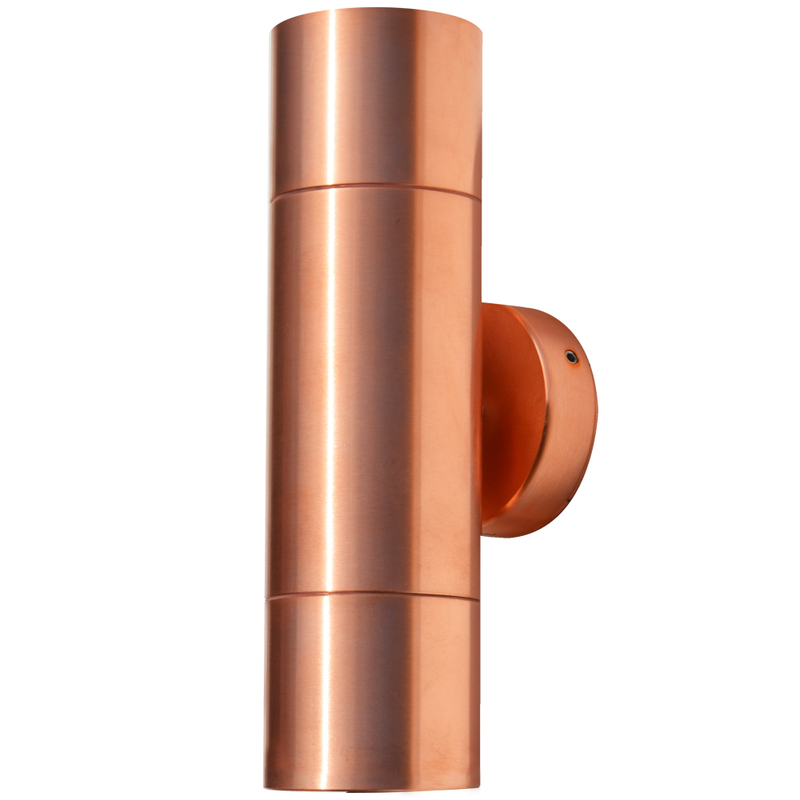 If a new copper finish is preferred, a layer of lacquer can prevent / slow down the weathering process. 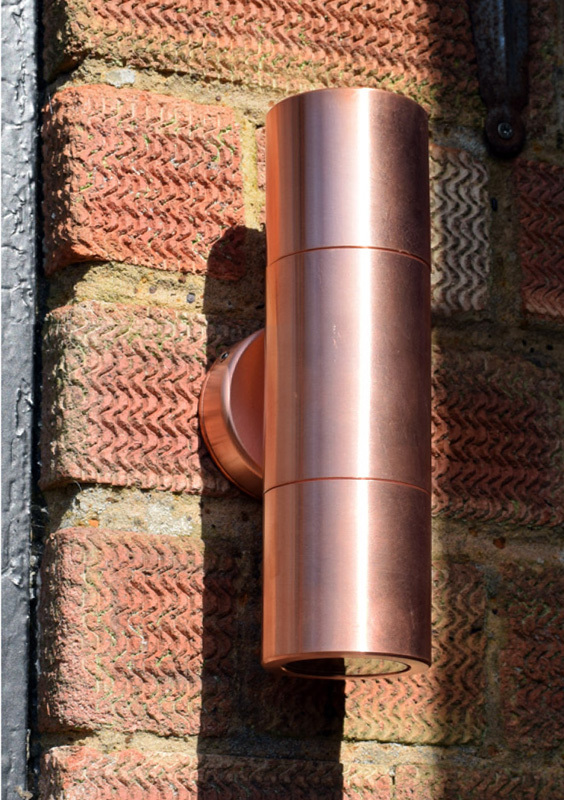 240v fittings can be affected by damp conditions, typically when located outdoors. When a fitting is located outside in the cold air combined with the heat produced by the lamp inside, it is inevitible that condensation will occur, just as it does on bedroom windows in the home. If too much condensation is produced, this could result in the fitting tripping, especially in these types of fittings where a drainage hole is not possible. To combat this, Lumena include silica gel with all 240v in-ground lights and spike light to soak up any excess moisture – these should not be removed but replaced periodically and fittings checked. If any water is sitting in the fitting, this should be tipped out and the fitting safely dried out. Condensation can be more prominent when the fitting has been opened on a damp day, as the damp air will then be trapped inside when re-sealed. Therefore it is recommended that any maintenance, including changing bulbs, is performed on a dry day. An additional practice put in place by Lumena is to apply Lithium Grease to the bulb holder / bulb which acts as an additional seal to prevent tripping. Although this prevents tripping, the fittings will still need to be checked and dried out should water sit inside the fitting. For extra protection, fitting can also be filled with Wiska Gel (electrical insulation).